Yes four dips to be precise. Olive oil whole wheat sesame crackers are the most loved crackers here and I had made the lotus stem chips for a friend who doesn't eat grains. By the way, I have been making many many varieties of crackers and somehow they never come to the blog. Many friends have been asking me to post those recipes as well so this Olive oil whole wheat sesame cracker is for compensating all the delay. And there is a quick recipe of lotus stem chips recipe as a bonus. 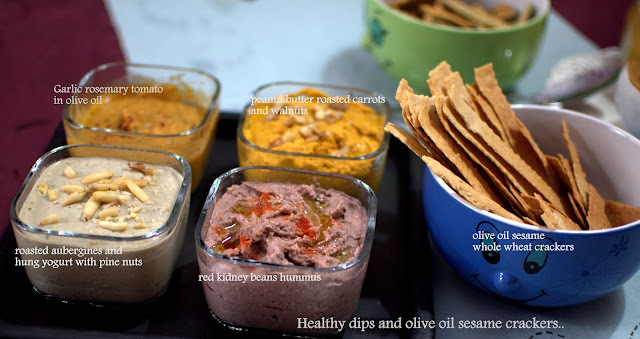 There are 4 types of dip recipes before I write about the cracker though. A garlic rosemary tomato in olive oil dip. 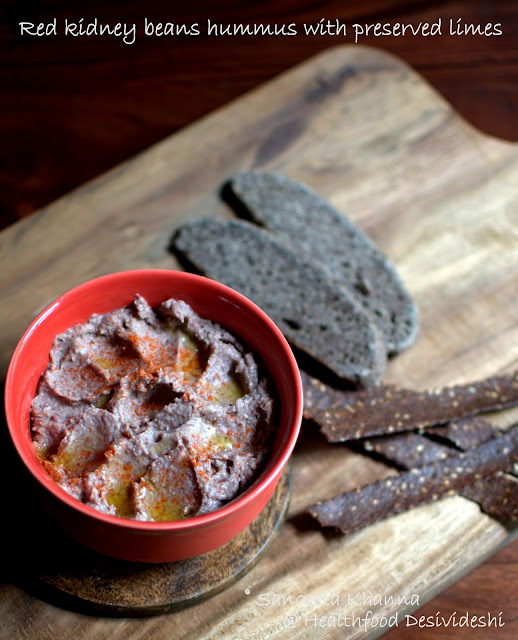 A red kidney beans hummus with preserved limes. 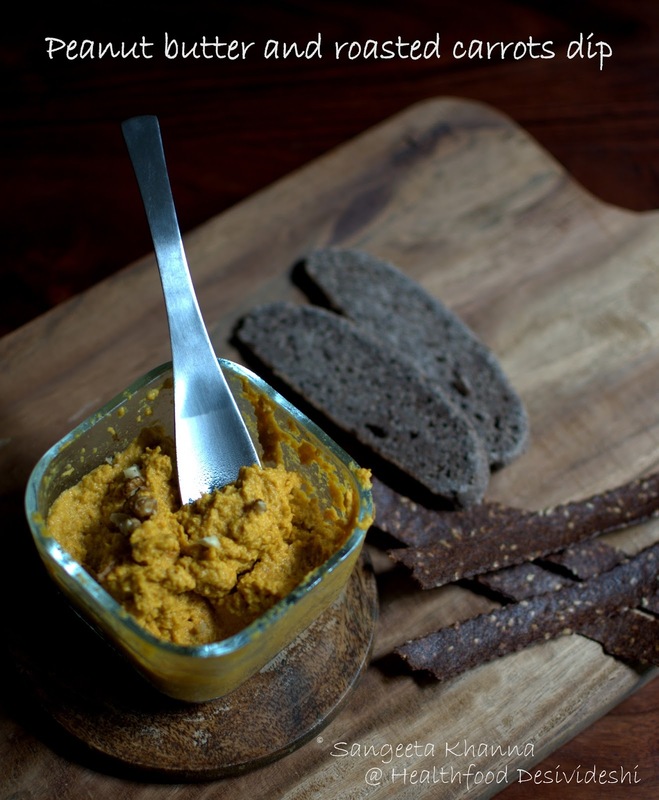 A roasted aubergine and hung curd dip with pine nuts and another roasted carrots and peanut butter dip with walnuts. Much loved, very versatile dips, will tell you how I use them differently. 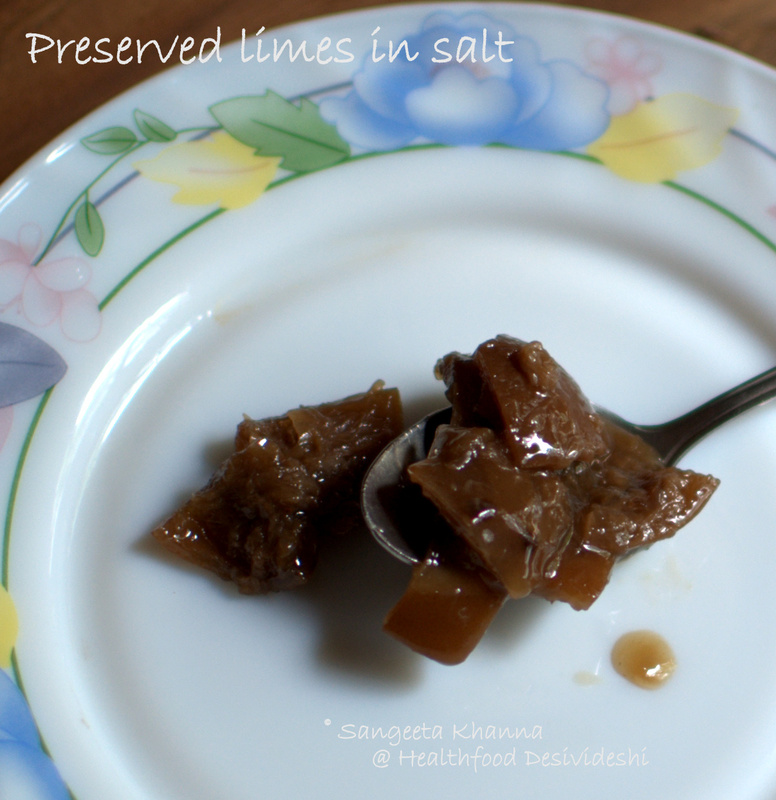 * The salt preserved limes are the ones I cut into halves or 8 pieces sometimes and fill in a sterile jar along with salt. 15-20% salt to limes is the usual ratio that preserves the limes really well and it keeps for years. The older the better. We call it nimki achar. Soak kidney beans overnight, discard all water, rinse and pressure cook with fresh water till done. It takes about 20 minutes after the first whistle in pressure cooker and about 45 minutes or more if cooking in a stockpot or pan. Powder sesame seeds first in the mixie blender. Add other ingredients and blend till smooth. Transfer to serving dish, drizzle with olive oil and red chilly flakes. Serving suggestions : Serve with any crackers you like. My variation this time was as a filling in a grilled whole wheat sandwich that was loved by the husband. Chop the carrots roughly, mix with olive oil and some garlic pods (as per taste) and herbs if required (I didn't use any), sprinkle salt and roast in the oven till roasted and done. You can pan grill them in a covered pan as well. Powder the peanuts first in the mixie blender, scrape every bit from the walls and blend again till it starts releasing oil and the aroma of peanut butter is evident. Add the roasted carrots and all the seasonings and blend again to make it all into a smooth paste. Empty into the serving dish, mix a few crushed walnuts lightly and garnish with some more crushed walnuts. Serving suggestions : I diluted this dip with some lemongrass and ginger infusion that I make for the mocktails and simmered it to make a nice soothing soup for myself. The husband liked it as a grilled sandwich filling. Roast the aubergines (any shape or size, I used my green oblong aubergines from the garden) over gas flame, peel and mash. Keep aside. Roast the green chilies too alongside the aubergines and peel them as well. I used the fat long green chilies that are not too hot. Place everything into the blender except pine nuts and blend till smooth. Transfer to serving dish, mix some of the crushed pine nuts into it and sprinkle the rest over the dip. Serving suggestions : This dip goes well with Indian style parathas and flat breads too. Try it with aloo paratha and see how it is polished off quickly. 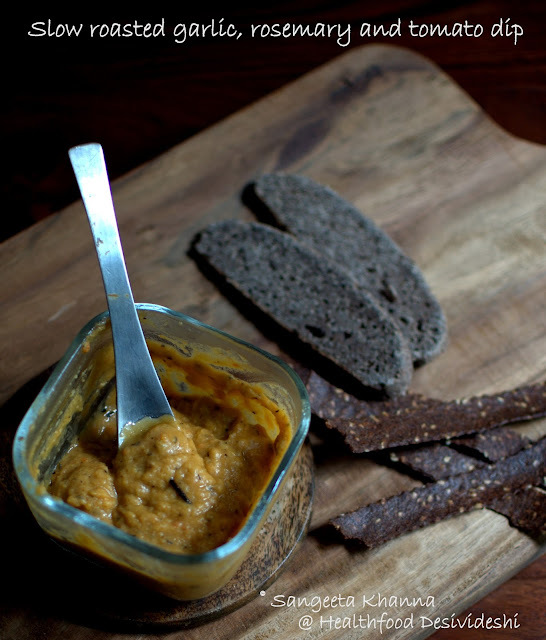 The ragi bread in the picture and the ragi sesame crackers too, taste really good with any of these dips. *Here is a good tip for you. 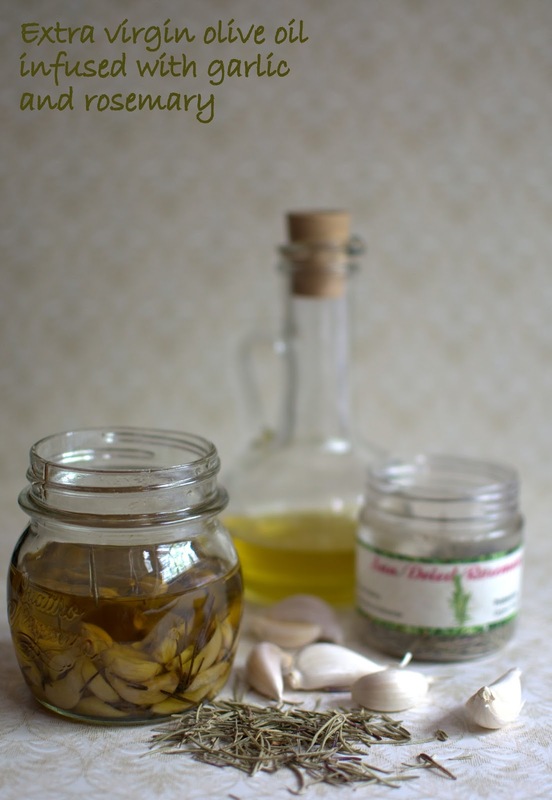 You make garlic infused olive oil and get slow roasted garlic cloves as a by product. So I had made a nice slow roasted garlic with rosemary when I did this garlic and rosemary infused olive oil for my salad dressings. Slow roasted because you keep about 2 cups of garlic pods, a generous handful of rosemary leaves and 250 ml of extra virgin olive oil in an oven proof dish and let it slow roast at about 70 C for a couple of hours in your oven. We used up the oil and the garlic was ready for a yummy dip. I used the infused olive oil as well in this dip, just as much as there was in the jar to submerge the garlic pods. Everything was put into a mixie blender and whirred till a smooth dip resulted. This dip was liked the most by everyone. Serving suggestions : this dip tastes great with any crackers and savory biscuits. It makes a nice dip with vegetable croutons too. 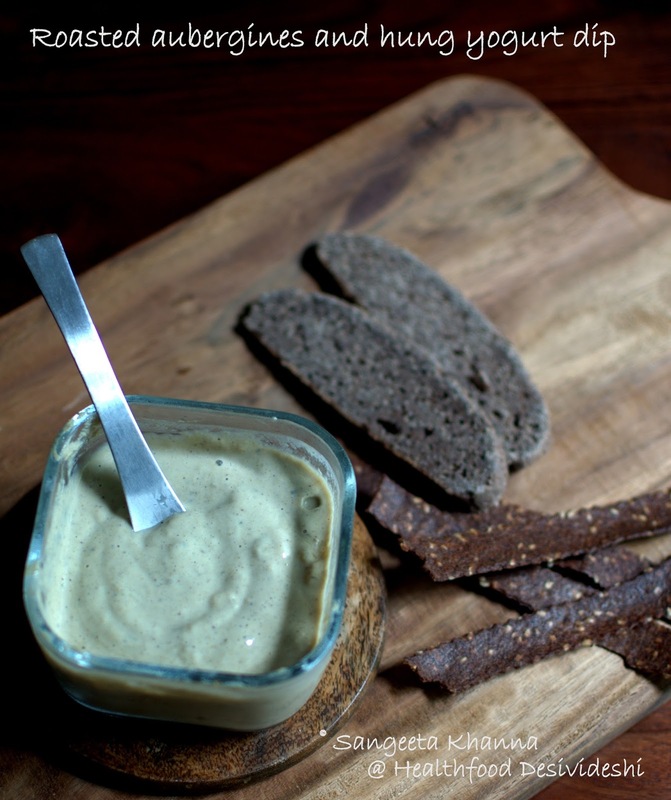 Use this dip to replace butter on breads and see how everyone loves it. Here is the recipe of whole wheat olive oil sesame crackers that were a rage wherever they went. Easy recipe and quick baking. Just be careful not to burn crackers as they get brown to charred as you blink. Mix the atta, olive oil, salt and pepper and soda bicarb really well, rubbing the mixture till it gets crumbly. Rinse the sesame seeds keeping it in a mesh colander under running tap water and add it to the atta mix. Knead a stiff dough using the whey. Now divide the dough in 4-5 small balls, roll out thin sheets between 2 layers of parchment or butter paper or plastic sheets. I use A4 size hard plastic sheets for this. Roll a multi cutter rolling pin over the sheet or cut crackers using a knife in desired shapes and transfer the cut sheet over baking sheet. Bake for 10 minutes at 180 C in a preheated oven. Cool on a wire rack and store in airtight container as soon as it cools down. Repeat the baking process till all the crackers are done. Now the recipe of the lotus stem chips. These are deep fried but they carry negligible oil when drained on kitchen napkins. Peel and slice the lotus stems thinly and at an oblique angle. Mix with salt, pepper and red chilly powder and let it rest for about an hour. Heat oil for deep frying, mix 2 rice powder with the slices, just to coat them all lightly and drop them in the hot oil, about 20-25 chips at a time. Keep the frying chips submerged in oil all the time, turning them once. Remove with a slotted spoon once the chops get brownish. Drain on kitchen tissue. Yes this starter course was served when a friends' family came over one weekend. I know it is really exhaustive regarding flavors and choices, looks difficult to pull through, but I had done all the preparation the previous day, only the lotus stem chips were deep fried just before serving. These were loved immensely and I was glad I made these. There was a lot of leftover too, I used them differently, the serving suggestions are provided at the end of each recipe. Drop in a line if you try any of these simple recipes. 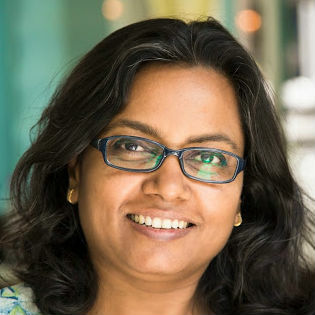 Yummy Sangeeta..!!! The dips sound and smell heavenly..:D am already drooling.. and cant wait to try them and to make it for my mom back in India.. she loves such dips and chutneys...! So many more dips to dive into. Just as I was thinking of more srts, this post comes along. YUM...so much variety. 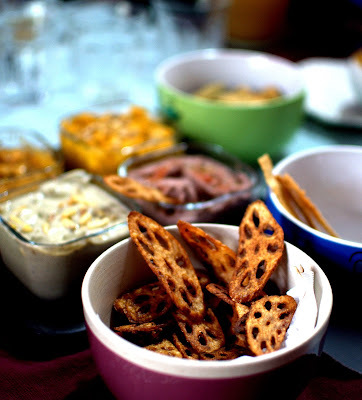 I love the lotus stem chips and the whole wheat olive oil crackers too. Delicious! YOU ARE INCREDIBLY INGENIOUS ! these all look so amazing and healthy to boot! Please do consider a Pin It button for your photos as these can go viral on Pinterest! Bookmarking this for sure Sangeeta! I love chip n dip and I am going to try each and everyone of this. And I love that they are all so healthy!